After studying with Leonardo da Vinci, Pontorno is comissioned with a series of paintings to decorate the room that Francesco Borgherini was going to use after his wedding, in 1515. These panels will reflect different scenes from the bible, in particular, from the life of Joseph, told in the book of Genesis (personally, I don’t think this motif would be the most adequate for spending a nice weeding night, but this is just my humble opinion). In Joseph with Jacob in Egypt we see several scenes from the life of Joseph gathered and combined in the same painting. The ideal would be to read his story directly from the bible, because I’m not going to tell all that happened with this character. 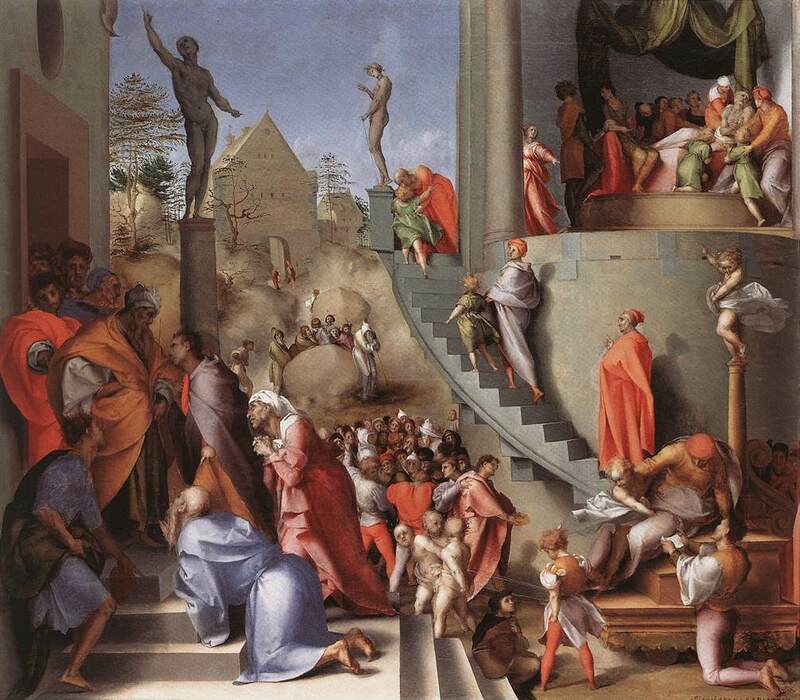 But I will describe the scenes in the painting: on the bottom left corner, we can see Joseph introducing his father before the pharaoh of Egypt; to the right, Joseph is sitting on a car hearing a petition; if we look at the stairs, Joseph is climbing it next to his son to see his dying father; and, at the end, above right, we also see Jacob blessing his grandsons. Pontormo unifies, in the same composition, different kind of figures, such as real characters on one hand; and angels on the other; and puts them in the middle of a surreal landscape, which has no coherence. The curious positions in which we find the characters, along with the general lack of balance of the composition, make the work typically manneristic, apart from the symmetry and the ethereal of the canvases in the renaissance. ~ by Álvaro Mazzino on March 1, 2011. If it fits your look, grab it. If not, don’t. Save your money for the right bag. A must-have is usually something that literally everyone wants or feels like they need to have. It’s shaping up to be quite a year for the Adidas Stan Smith and it hasn’t even got to tennis season. Hot on the heels of the Stan Smith Boost Primeknit come the Tennis HU. This entry was posted on March 1, 2011 at 12:32 and is filed under Mannerism.You can follow any responses to this entry through the RSS 2.0 feed.You can leave a response, or trackback from your own site.